We have a lot of games. I like games. Kiddo LOVES games. New Kid, my toddler-almost-preschooler, always wants to do whatever his awesome big brother is doing. It’s not so easy to play the same game with your almost 7 year old and your almost 3 year old at the same time. Skippity: New Kid likes to sort the chips by color, place them on the squares (1 to 1 math skills), and stack them (fine motor). Scrabble: He sorts them by letter and makes the alphabet (literacy). Boggle: He loves to shake the box (sensory), place them in the squares (1 to 1, fine motor), and tell me the letters (literacy). Chinese Checkers: Oh, how much fun it is to put the pegs in the holes! (fine motor) Chinese checkers with marbles would work equally well. So put on your toddler glasses and take a look in your games closet. You don’t have to follow the instructions in order to play a game. After all, aren’t rules meant to be broken? Great idea! My “new kid” would love this! I forgot all about Rush Hour! Great game! I think my “kiddo” might get it for Christmas. Never heard of Rush Hour before… we'll have to try this game. The almost three year old at our home adores playing with his 6 year old sister's games and has for almost a year now. We let him invent his own ways to play when his sister is at school ( he likes to use his dump truck and steam shovel to scoop up small game pieces as an example), and when she's home we play altogether, and he'll be on a team with one of us. Zingo Bingo,Hungry Hungry Dog, Concentration-(Played With Color Cards), and Balderdash are ones he's been able to join in on since he's been two. Such fun! Thanks for a great post. This is such a good idea. I wouldn't have thought of letting my younger kids “play” older games. I'll be pinning this one 🙂 Glad to find you on the I can teach my child link up! I showed our three year old the chess set and we ended up playing a game of goodies and baddies with his toy tanks and the chess pieces. it wasn’t what i’d originally had in mind but it was great fun. I love your Family Game time pinterest board, I’ve shared it on my FB page. I’ll be pinching ideas from that for ages. Oh, thank you so much! 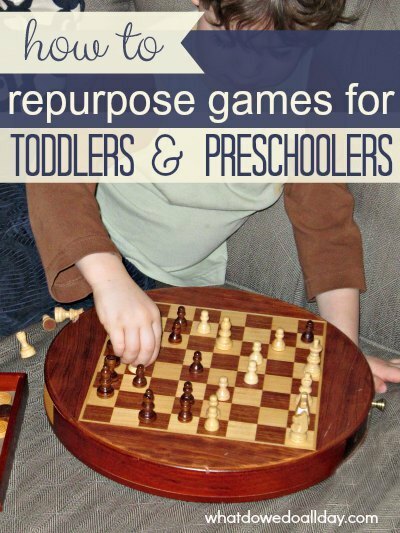 Those chess pieces are so much fun to add into pretend play.